Music and media producer Spencer Proffer and Africa’s Leading Luxury Train, The Blue Train, announced a partnership of a unique experience to celebrate John Coltrane and South African jazz music, through the South African private screening of the acclaimed John Coltrane feature documentary, Chasing Trane, on board the iconic South African ‘Blue Jewel’. The film will be exhibited on a two-day journey, November 9-10, 2017, aboard The Blue Train. On board; media, guests and all invited dignitaries will be treated to a combination of unsurpassed luxury travel, five-star accommodation, fine cuisine (accompanied by the best wines sourced from the best South African vineyards), personalized butler service and breath-taking views of the South African countryside. This is the first time that a film premiere will be showcased in this manner, aboard a train, and it will be an unprecedented experience attended by guests from around the world. One of Coltrane’s most successful albums was titled Blue Train. It is still considered amongst the most respected works in the genre. Sponsors for this grand event will be announced at a later date. Papi Molotsane, a highly respected South African business leader, is the conglomerate partner on the ground for this event and serves as the Co-Executive Producer. His company will coordinate all activities, extensions and brand participations and activations in South Africa. Los Angeles based Vivian Ying Yang serves as a Consulting Producer to Proffer and Meteor17. NYC-based marketing executives Reggie Miller and Gary R. Lewis, have joined the M17 team to further help with the conceptualization of this project. Harding, will accompany Proffer to produce the event in South Africa. The 2-day experience will feature 6 popular, contemporary, South African jazz musicians who will perform original compositions in the spirit of the jazz legend at key destinations; a private concert for The Blue Train guests in the fields of the famed Delaire Graff Wine Estate in Stellenbosch. As the tour winds down and for the grand finale, a public concert will be held at Kaleidoscope, a leading Cape Town contemporary club. South African music producer, composer and Grammy nominee for his work with Hugh Masekela, Don Laka, will direct and oversee all the musical aspects of this experience. Current hit South African artist Dr. Bone as well as highly respected jazz saxophonist, McCoy Mrubata will perform with other hot, local artists at both Delaire Graff and the Kaleidoscope Club, as well as join the guests on this journey. Esteemed South African fashion designer and original King of Kotini, Ole Ledimo, founder of House Of Ole, will be showcasing African designs inspired by John Coltrane’s life. 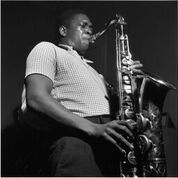 Chasing Trane, produced by Spencer Proffer, Dave Harding, Scott Pascucci and John Beug, premiered at the prestigious Telluride and Toronto Film Festivals, and then followed by openings at select U.S. theaters through a distribution deal with Abramorama. The film will be available on Netflix around the world, from November 2017. Denzel Washington performed the narrative voice of John Coltrane. President Bill Clinton, along with Common, Carlos Santana, Wynton Marsalis, John Densmore, Kamasi Washington and many of the living musicians who performed with Coltrane (Sonny Rollins, McCoy Tyner, Benny Golson, Reggie Workman and Jimmy Heath) contributed to the film. Headquartered in Los Angeles, this convergence and production venture is helmed by innovative media and music producer, Spencer Proffer. M17 is producing and is developing an ambitious slate of projects across music, TV, film, Internet, live event, and other platforms, integrating brand marketing and music as organic components. M17 is a full-service organization that actively participates from conception and architecture through all phases of deal making, production, marketing and distribution entities. http://www.meteor17.com. Spencer Proffer is a highly regarded media producer and strategist with a long history of connecting with audiences. His productions and those he has been integrally involved with have garnered Academy, Golden Globe, Emmy, Grammy and Tony awards and nominations. As a music producer, his work has achieved multiple gold and platinum record sales throughout out the world. The Blue Train launched in 1946 and offers a unique way of experiencing some of Southern Africa’s magnificent landscapes and landmarks. For additional information, please visit http://www.bluetrain.co.za.